Camera devices have been marginalized with the out surge of mobile phone devices. Today common user prefers mobile cameras over any specific camera device to capture his or her precious moments. Due to this new compulsion people keep on clicking pictures all the time. This trend has necessarily occupied a big chunk of storage space dedicated to pictures in your device. These pictures include your personal moments and other private videos as well. Thus the demand for such a tool rises, which helps you keep these personal pictures and videos safe. 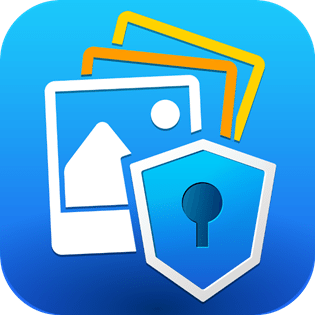 One such tool is Secret Photo vault which is an efficient app with additional safety features. It is offered by software firm Systweak Software, which is highly regarded for its useful products. 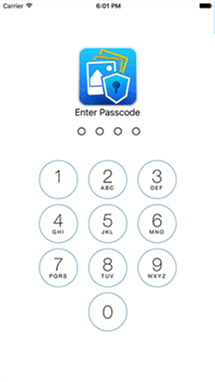 Enter Passcode: Once you have installed Secret Photo Vault app it will ask you to set a PIN to protect your secret vault. 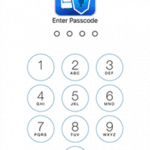 You need to enter and then re-enter 4-digit PIN to save it as your passcode. You will require entering your PIN every time you access your secret vault. 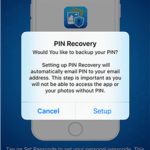 PIN recovery: It will ask you to set PIN recovery. In PIN recovery process app will send your PIN details to your email account. It will help you recover your PIN details in case you forget it. Add Photos: Here you can import all your personal picture & videos to secret vault. You can save them to default photo album or you can save them in different folders (by creating a new folder or in existing folders). You can take pictures from your device camera to store it in secret vault. Further, you can set a different password for all different folders to protect them with a dual password. 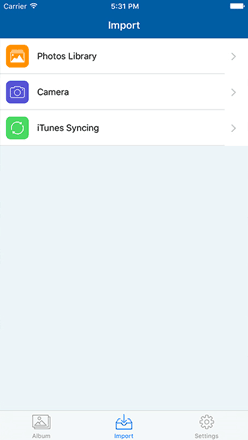 You can also export or move pictures from your albums. Click on the Apps tab on the left panel. Click on “Secret Photo Vault” under File Sharing head. Click on ‘Add..’ button at the bottom to add photos & videos. Following this process, you can import any photo or video file to your mobile device. Image Quality: You can set image quality to “Original” or you can optimize it so that it occupies less space on your device. 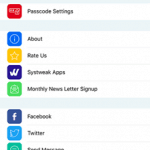 Passcode Settings: Passcode Settings helps you perform these tasks. You can enable Touch Id option to authenticate use of this app using your fingerprint. 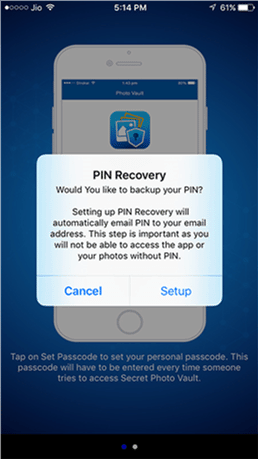 It will enable “Recover Passcode” option once you enter the email ID for PIN recovery process. You can mention the recovery email ID in “Recovery Email” option. This is an efficient tool to keep your data safe against any eventuality. Using this tool, you can protect your personal data from avid onlookers and from unwanted people. You can also keep your data intact in case of device loss. 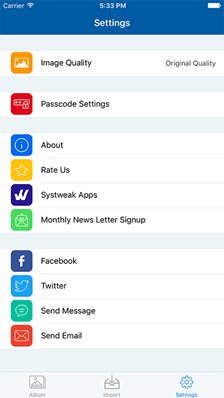 This app offers some unique and advanced features to keep your data safe. Strongly recommended!